Hey, everyone. Willow here. Take a minute today to run over to Dru's Book Musings and learn a little about a day in the life of Starla Cupp. Yep, the owner of the Dixie Cupp Diner dishes about her life in Sugar Hill, Virginia. Get a glimpse into her day and meet some of the zany characters she hangs out with. Starla is just a treasure. She's a sweet, southern gal with just a little bit of sass. And no one gets away with murder when Starla is on the case. 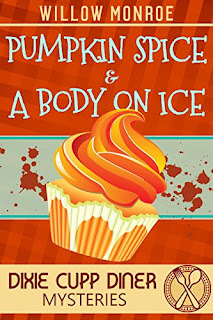 And while you're at it, hop on over to Amazon and pick up the first book in the series, Pumpkin Spice & a Body On Ice. It's a perfect fall read. You can read it free with Kindle Unlimited! "I know that the secret to life is to live it on purpose."